For the sixth year in a row, the Locust Fork varsity girls brought home the Blount County championship trophy. It began with a win against Southeastern. The Lady Hornets took a quick lead and went into halftime 50-13. They continued to dominate and won 70-39. Carissa Horton scored 34 percent of Locust Fork’s points with 24. Horton also had four rebounds, four steals, and two assists. Madison Roy had 12 points, eight assists, six rebounds, and three steals. Skylar Massey scored 10 points and also had two rebounds, two steals, and one assist. The Lady Hornets’ next opponent was the Hayden Wildcats. With the score tied at 22 at halftime, it looked to be a close game. However, Locust Fork outscored Hayden in the third and fourth quarters. The Hornets scored 21 points in the third quarter, while the Wildcats scored 14. Locust Fork then added 24 points in the fourth quarter and Hayden scored only eight. Locust Fork defeated Hayden 67- 44. 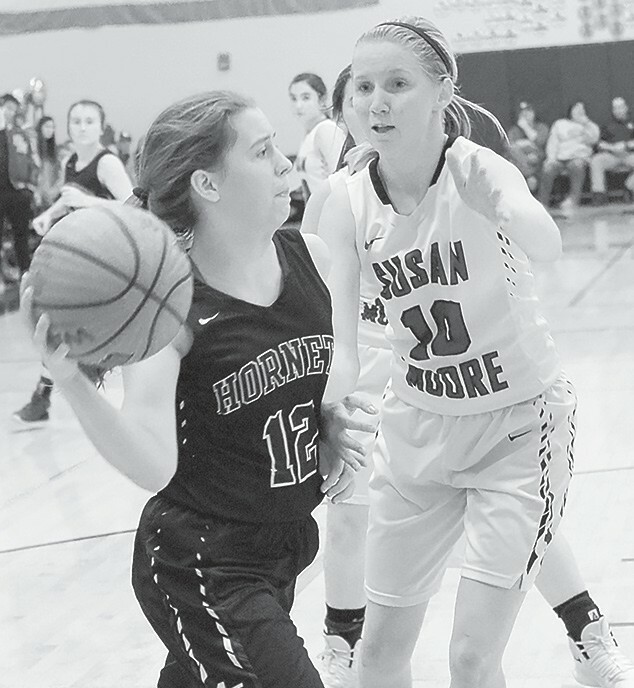 Roy, an eighth-grader, led the Lady Hornets with 21 points, three steals, two assists, and one rebound. Horton scored 19 points and also had nine rebounds, five assists, four steals, and one block. Sydney Baker had 14 points and four rebounds. Shelly Bailey had 13 points, six rebounds, and two steals. Locust Fork’s final showdown was against Susan Moore in the championship game. The Hornets jumped to a 21-14 lead in the first quarter. They maintained that lead into halftime 45-27. The Lady Bulldogs came out of halftime strong, but they were not able to catch up from the deficit. Roy scored 19 points and had four rebounds, three steals, and three assists. Massey had 18 points, three rebounds, one steal, and one assist. Horton had a triple-double with 16 points, 13 rebounds, and 10 assists, as well as contributing two steals. Bailey scored 12 points and had eight rebounds, five assists, three blocks, and two steals. With the championship win, the Lady Hornets improved to 17-6 and the Lady Bulldogs are 21-3 going into area tournaments.